Staying with non-representational art, next up in our History of Art project was Piet Mondrian. The boys immediately grasped the elements of his distinctive style and they do seem to be more enthused when an artist has a strong, clear style they feel they could replicate. They liked the use of primary colours against stark white and bold black and the way in which many of Mondrian’s later works were reminiscent of street maps. Again, my 9 year old invested minimal effort in his art work. I think it is very much time for him to return to school. 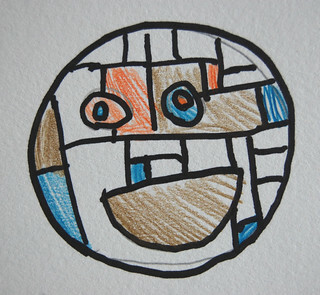 His drawing, therefore, was a simple smiley face. He wondered what the effect would be of using any three random colours instead of the primaries so dipped his hand into the bag of pencils with his eyes closed and ended up with blue, brown and orange-red. My 6 year old started off not using a ruler so that gave me the opportunity to teach him how to use a ruler for drawing straight lines rather than just for measuring or underlining. He used Sharpies which created very bold, vibrant colour but he found it difficult to stay within the lines – though I suspect partly that was by choice. Given that Mondrian worked in straight lines and geometric shapes, a homage to his style lent itself perfectly to my oldest son’s love of drawing Minecraft characters. He opted for a Ghast because the tentacles form rectangles. Like his youngest brother, he opted to use Sharpies. I think it is a really effective drawing. 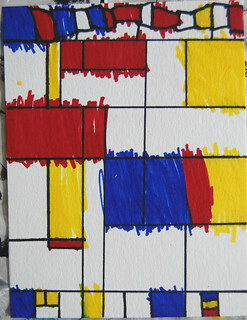 Maybe Mondrian would have loved Minecraft. 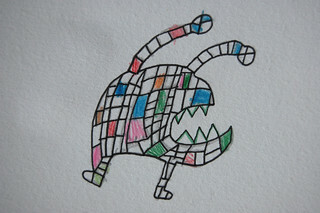 My 8 year old unleashed his imagination and drew the outline of a small monster which he then filled with free-hand drawn squares and rectangles. I think it’s great. 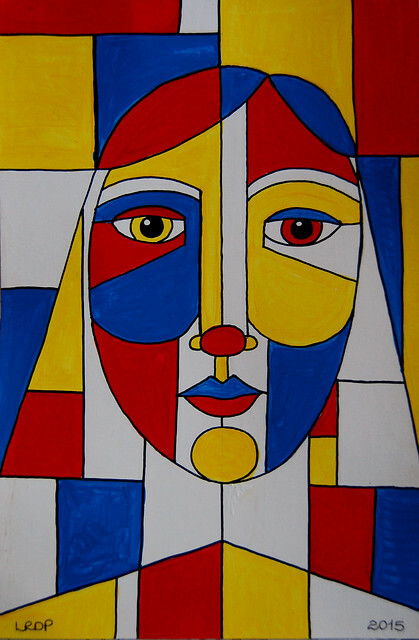 I decided to paint a female face using Mondrian’s use of line and primary colours. It looked like a terrible mess until I added the black lines. That pulled the piece together. 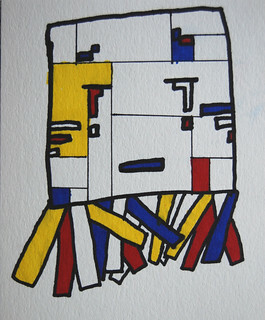 You can see my Mondrian inspired Crazy Critter over at my art blog. Love ’em all! Again, your boys made me chuckle. Ah the 8 yr old won my heart today. I think he really went outside his comfort zone. And as always I love how you did your painting most especially the vivid color placements that really compliments each other. I must say I actually really like your 9 year olds artwork this time, maybe I like his minimalistic style! And your piece is brilliant Laura, very vibrant!! Love all the drawings!!! Your boys artwork is a delight. Your work is outstanding. Mondrian would be honored I think. And I’m thrilled to see your use of art techniques to simultaneously teach critical thinking skills! Good job! Thanks. This was a fun project. This summer’s project is set based too: fantasy travel journals. How fun!!!! In a tangentially related note have you seen “The Mystery Mansion”? I just read a very nice review of it here https://joymurray.com/2018/07/10/review-mystery-mansion-a-storytelling-card-game I can see you and your boys doing a Creepy-cute monster story card series somewhat in the vein of…. I have not heard of that at all. That’s surprising since my husband is a board and card game geek and reads blogs and other websites about classic and new games. I’ll need to ask him if he’s heard of it. I was enchanted when I read about it… Will look forward to hearing what you both think of it.